On a quiet corner in my little downtown, there’s a charming chocolate shop. It’s the kind that draws you in from the sidewalk with the scent of warm cocoa and walls covered with colorful sweets, and behind the displays, if you’re lucky, you will see someone dipping apples into large copper pots of glossy chocolate. Chocolate caramel apples are my favorite treat when I visit this little slice of heaven, and every time I go downtown, I always quietly wonder if I have enough time to stop by and pick up some apples to bring home. 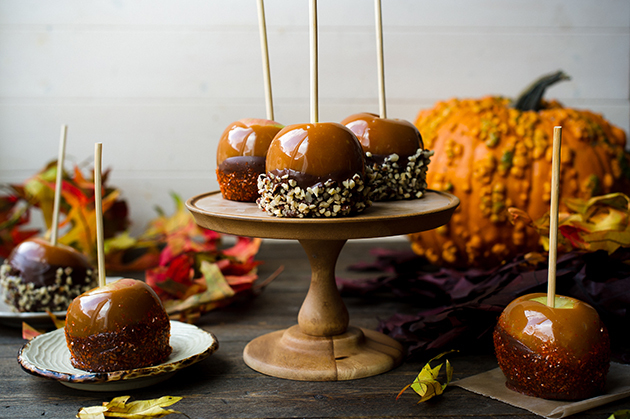 But now that the leaves are falling and apples are everywhere, there’s no reason why I can’t make my own Double Dipped Chocolate Caramel Apples. They’re easier to make with the KitchenAid® Precise Heat Mixing Bowl. First, give the apples a quick bath in boiling water with a touch of distilled vinegar. 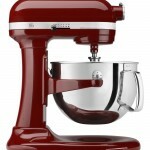 I used my KitchenAid® 1.25L Electric Kettle, which makes boiling water quick and easy. A 5 second soak is all you need, and not only does this clean your apples, it removes the wax (if any) to help the caramel stick to the apples better. Dry the apples thoroughly with a kitchen towel, then remove the stems and insert a sturdy stick through the center. Place the caramels and 1 tablespoon of water in a small sauce pan set over medium heat and stir as they begin to melt. In the meantime, preheat the KitchenAid® Precise Heat Mixing Bowl to 170°F. 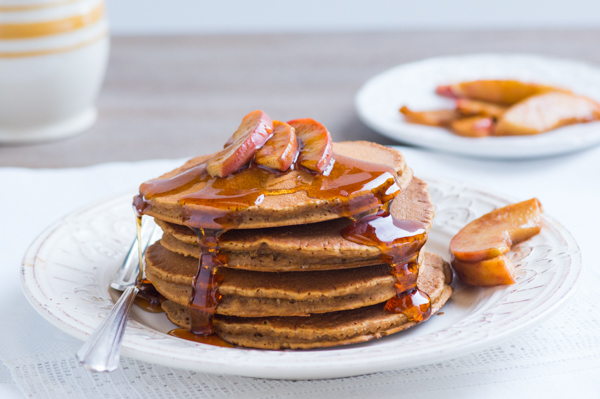 Once the caramel is melted, transfer it to the KitchenAid® Precise Heat Mixing Bowl, which will help keep the caramel at the right temperature for dipping. If you find that the caramel is hardening too quickly, you can increase the temperature to 220°F. Begin dipping your apples into the caramel, coating them evenly. Let some excess drip off for a few seconds, then turn the apple over so you are holding it like a lollipop. Hold for a few seconds more, allowing the caramel to stay on the apple longer. Place the apple on a parchment-lined KitchenAid® Professional-Grade Nonstick Half-Sheet Pan. Continue with all the apples. Let the apples set in the refrigerator for 30 minutes. In the meantime, wash and dry the insert of your KitchenAid® Precise Heat Mixing Bowl, then attach it to your KitchenAid® Stand Mixer. Melt the chocolate using the chocolate mode to guarantee perfectly tempered chocolate. Dip the bottom halves of the caramel apples into the melted chocolate and place on a parchment-lined baking pan. If you will be decorating with nuts, you can go ahead and dip the apples into crushed nuts. If you will be sprinkling with sprinkles or edible glitter, you can do that as well. But if you plan on decorating with candies, let the chocolate dipped caramel apples cool for a few minutes, then dip them into the candies; this will help them stay on the apples rather than slide off. Let the apples cool for about 10 minutes, then enjoy! Give the apples a quick bath in boiling water with a touch of distilled vinegar. 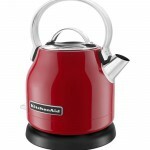 Bring 4 cups of water to a boil using the KitchenAid® 1.25L Electric Kettle. Place the boiling water in a bowl with the distilled vinegar. Dip the apples for 5 seconds, then use a slotted spoon to remove. Dry the apples thoroughly with a kitchen towel, then remove the stems and insert a sturdy stick through the center. Prepare two baking pans by lining with parchment paper. Set aside. Place the caramels and 1 tablespoon water in a small sauce pan set over medium heat and stir as they begin to melt. 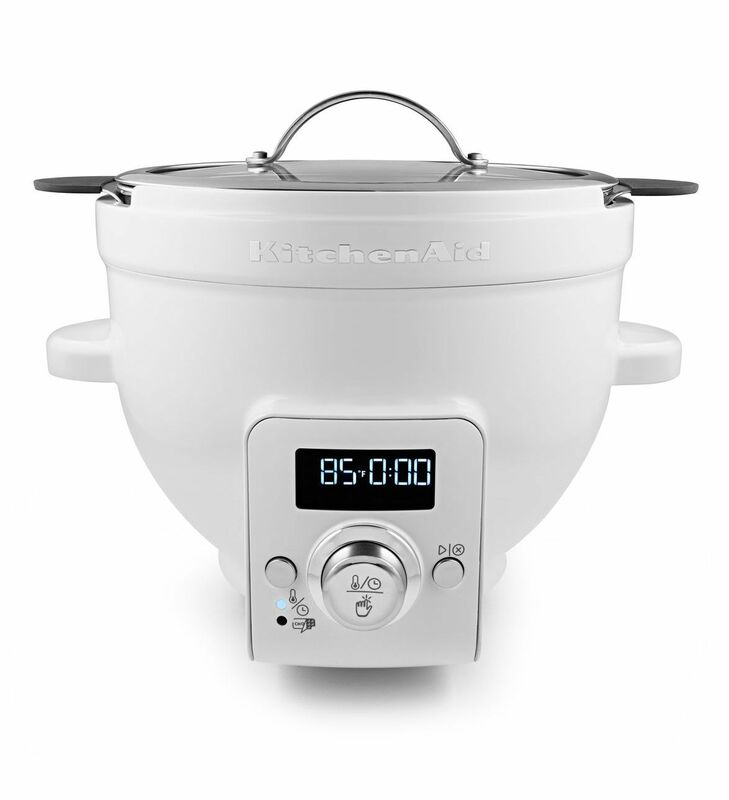 Preheat the KitchenAid® Precise Heat Mixing Bowl to 170°F. 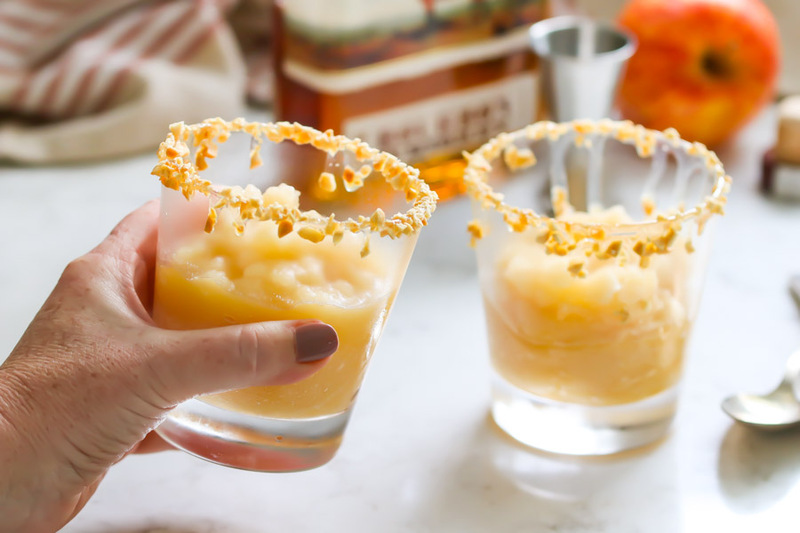 Once the caramel is melted, transfer it to the KitchenAid® Precise Heat Mixing Bowl, which will help keep the caramel at the right temperature for dipping. Begin dipping your apples into the caramel, coating them evenly. Let some excess drip off for a few seconds, then turn the apple over so you are holding it like a lollipop. Hold for a few seconds more, allowing the caramel to stay on the apple longer. Wipe any excess off the bottom base of the apple with a knife or spatula. Place the apple on a parchment-lined KitchenAid® Professional-Grade Nonstick Half-Sheet Pan. Continue with all the apples. Let the apples set in the refrigerator for 30 minutes. Wash and dry the insert of your KitchenAid® Precise Heat Mixing Bowl, then attach it to your KitchenAid® Stand Mixer, and attach the flat beater. Melt the chocolate using the chocolate mode; place about 3/4 of the chocolate chips in the mixing bowl as the bowl preheats. Once pre-heated and the display shows that you can add more chocolate, do so 1/4 cup at a time, while stirring on low speed. When all the chocolate has been added and the display shows that the chocolate is tempered, remove the KitchenAid® Precise Heat Mixing Bowl from the KitchenAid® Stand Mixer. Dip the bottom halves of the caramel apples into the melted chocolate and place on a parchment-lined baking pan. If you will be decorating with nuts, you can go ahead and dip the apples into crushed nuts before placing on the baking pan. If you will be sprinkling with sprinkles or edible glitter, you can do that as well. But if you plan on decorating with candies, let the chocolate dipped caramel apples cool for a few minutes, then dip them into the candies; this will help them stay on the apples rather than slide off. Let the apples cool for about 10 minutes, then enjoy! 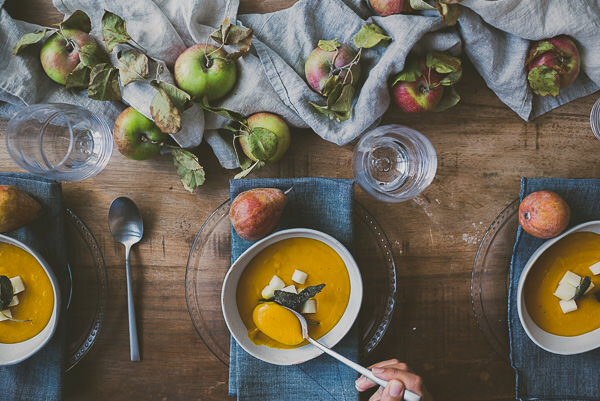 Apples can be stored in the refrigerator until ready to eat.